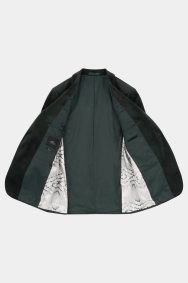 When you have an invite to something special, be brave with this on-trend dress jacket. 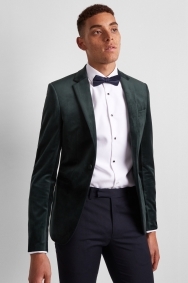 With its rich green tone and velvet material, it’s unique but still smart, and the skinny fit will give you a sharp outline. 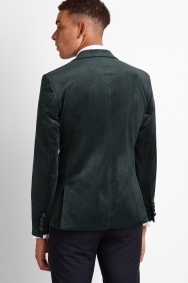 A notch lapel keeps it simple and the velvet-covered buttons create a seamless finish. 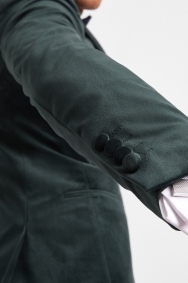 A contrasting matchstick-patterned internal panel adds extra interest and will catch attention when you take it off. 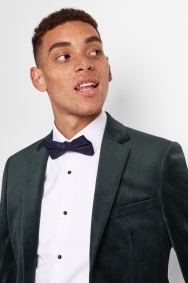 Choose smart black pants and a white dress shirt as the backdrop for your outfit, then add a navy, deep silver or black bow tie to meet the dress code. I hope there are more available sizes for suits. Fit really well. A bargain at £99, but with the 20% discount this was an absolute steal! Adore my green velvet jacket, brings my Irish side out!